During neuromuscular monitoring, repeated electrical stimulation evokes muscle responses of increasing magnitude (‘staircase phenomenon’, SP). We aimed to evaluate whether SP affects time course and twitches’ values of an acceleromyographic assessed neuromuscular block with or without previous tetanic stimulation. 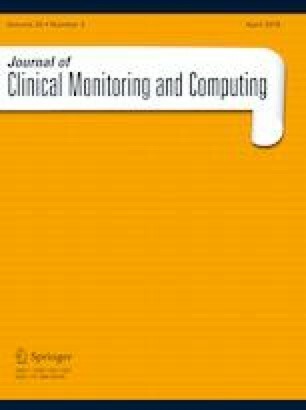 Fifty adult patients were randomized to receive a 50 Hz tetanic stimulus (S group) or not (C group) before monitor calibration. After 20 min of TOF ratio (TOFr) stimulation rocuronium was administered. Onset time of block (primary endpoint), recovery of T1 to 25%, TOFr to 0.9, and recovery index were compared. We also compared T1 and TOFr at baseline, post-stimulation, and during recovery from block. Moreover the correlation between T1 at maximum recovery and (a) baseline T1 and (b) post-stimulation T1 along with T1/TOFr ratio during recovery were evaluated. After stimulation median T1 increased (32%) in group C and decreased (16%) in group S (P = 0.0001). Onset time (Median [IQR] in seconds) was 90 (29–77) vs. 75 (28–60) in C and S group (P = 0.002). Time [Mean (SD) in minutes] to normalized TOFr 0.9 were 70.13 (14.9) vs. 62.1 (21.2) in C and S groups (P = 0.204). TOFr showed no differences between groups at any time point. T1 at maximum recovery showed a stronger correlation with post-stabilization T1 compared to baseline. (ρ = 0.80 and ρ = 0.85, for C and S groups.) Standard calibration does not ensure twitch baseline stabilization and prolongs onset time of neuromuscular block. TOF ratio is not influenced by SP. Published in part as a PhD dissertation (GM, available at: https://www.educacion.gob.es/teseo/irGestionarConsulta.do;jsessionid=DBD573CC72EAAC90F8B46CAFA69986F3). The online version of this article ( https://doi.org/10.1007/s10877-018-0157-9) contains supplementary material, which is available to authorized users. No funding was received for the conduct of this study and no sponsor was required. GM and MMF have no conflict of interest. CLE and OD received payment for educational talks and scientific conferences from MSD (Merck Sharp & Dohme, Inc.). No conflict of interests related with the present work. Ethical approval was granted by the applicable Institutional Review Board as detailed in the text. The staircase phenomenon is a phenomenon related to, but not entirely identical to postetanic potentiation . It has been showed in animals that the increment in evoked mechanical response, but not the compound action potential, is associated to the number of indirect stimuli administered (up to a plateau of 250) , due to the phosphorilation of the myosin regulatory light chain  which enhances cell’s sensitivity to calcium and a subsequent increase in contraction force , a process likely mediated by calmodulin [33, 34].